The 2018 summer heatwave caught a lot of us off-guard. For marketers, the glorious weather presented a fantastic chance to boost sales and opportunistically reach a new audience. But they had to think fast, move quickly and rise above competitors to be seen amongst the noise. So how did tactical marketing help businesses turn up the heat during these holiday-esque periods? DS.Emotion took advantage of the heatwave to help attract crowds to Dukes Lane in Brighton. We were able to utilise the outdoor courtyard for events, such as our drag queen fundraiser. We also worked closely with Holly’s Kitchen, a local café, to promote their cocktail launch and seating area due to its perfect location in the sun-soaked courtyard. Every month we host tenant engagement meetings to make the most of potential marketing opportunities. This gives us a regular meeting opportunity to share our responsive marketing ideas with tenants. It’s a great way to set the wheels in motion. 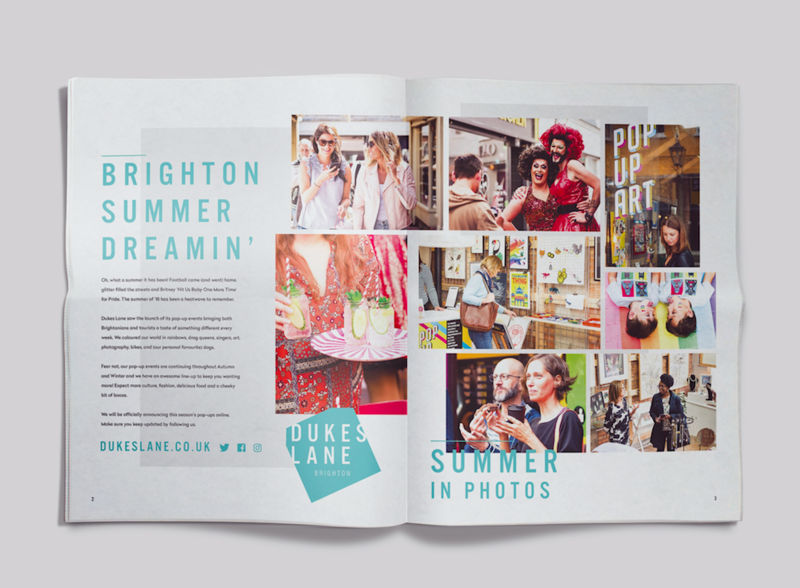 The introduction page to the Dukes Lane Autumn newspaper shows a lovely reflection of summer on the Lane. Look how much fun we had! Fitbakes sells low sugar cakes, but saw sales drop 60% as the heatwave hit. Looking for inspiration, Fitbakes noticed social media users pairing their cakes with low calorie ice cream brands such as Breyers and Halo Top. They launched a social media campaign showcasing images and video content of their cakes and low calorie ice creams together and sales rocketed. Summer was saved! According to PostBeyond: “Messages shared by employees reached 561% further than the same message shared on a company’s branded channel.” Think about it… the more engaged an employee; the more likely they are to share great things about your brand. Residents at Exchange Quay got into the festival spirit by making their own flower garlands and adding some glam to their wellies. The decoration station was set up in the outdoor communal areas situated in the middle of the office space’s seven main buildings. The event was open to all Exchange Quay residents, bringing professionals from a range of companies together to get creative in the sunshine. Residents came together to paint wellington boots, putting their own individual stamp on the festival must-have. The craft workshop was just one of the wellbeing-focussed initiatives happening at Exchange Quay over the summer period. The World Cup featured heavily across many marketers’ social calendars. Though most campaigns were carefully considered and planned out rather than responsive, not everything went to plan (William Hill, we’re looking at you). However, some brands’ attempts to woo fans with their world cup support was a success. Perhaps the most notable responsive social media marketing came from posts by the England team themselves. As undoubted influencers, Instagram users were watching their every post – and fans weren’t disappointed. It’s interesting to note the team have been given social media training throughout their careers. It wasn’t just their time to shine on the pitch – they had to let their tweets do the talking, too. The DS.Emotion team are well-versed experts in intelligent and timely marketing. We know when it’s appropriate to develop pop-up events and marketing strategies to suit the season or occasion. We also know some things can’t be planned and we like being kept on our toes. Contact us to join forces – let’s create something brilliant for the Autumn Winter period!